The photo above is a two centuries old birdhouse crafted with the same care and skill as the stonework of Ayazma Camii (Holy Spring) Mosque on which it clings. The charters for new mosques often included provision for feeding the birds that lived in these shelters. The Beyazit II mosque in Istanbul, built in the late 15th century, had a charter that allocated 30 pieces of gold each year to look after its birds. Even when the charter was eventually revoked in the 1920s the official then in charge of the mosque continued to feed them out of his own salary until 1947. In the great Dolmabahce Palace there’s a room that was devoted to looking after sick and injured birds. Fazil Husnu Daglarca, the famous Turkish poet, relates how a man in Sivas used the income from two shops to look after the city’s birds, and all across turkey you come across similar endowments. In Islam there’s a tradition, at least there used to be, of endowments for everything from poor kitchens, fountains, homes for widows and alms for orphans to trousseaus for poor girls and books for libraries and colleges. Endowments providing water and grain to birds and other animals were just a part of this enlightened attitude. You can also see more photos on a recent post at Islamic Arts and Architecture. Hat tip (again) to Dr. Stephennie Mulder. It worked in theory and it seems to work in practice too. Work continues on the Super Simple Clock. I had been pondering the best way insert bushings into cardboard for days when it came to me while I was putting on my daughter’s shoes — grommets! A little sanding with 220 grit on the 1/4″ dowel and it runs quite nicely. I’d didn’t have any 1/8″ dowel on hand but to my delight, I found that bamboo skewers are a remarkably consistent 0.005″ less than 1/8″. The double thickness of Cheerios box may be a bit of challenge to cut for 10-year-olds, but with sharp scissors and some determination I really think they can do it. They’re too young for carpal tunnel syndrome right? This June I’ll be teaching a summer camp class to 4th and 5th graders titled “Gears and Gravity.” In my proposal I claimed, “We will explore the history and science of time keeping (horology) by hands on experimentation with simple machines and then construct our own real working mechanical clocks from paper and wood.” Now I have to design said clock. 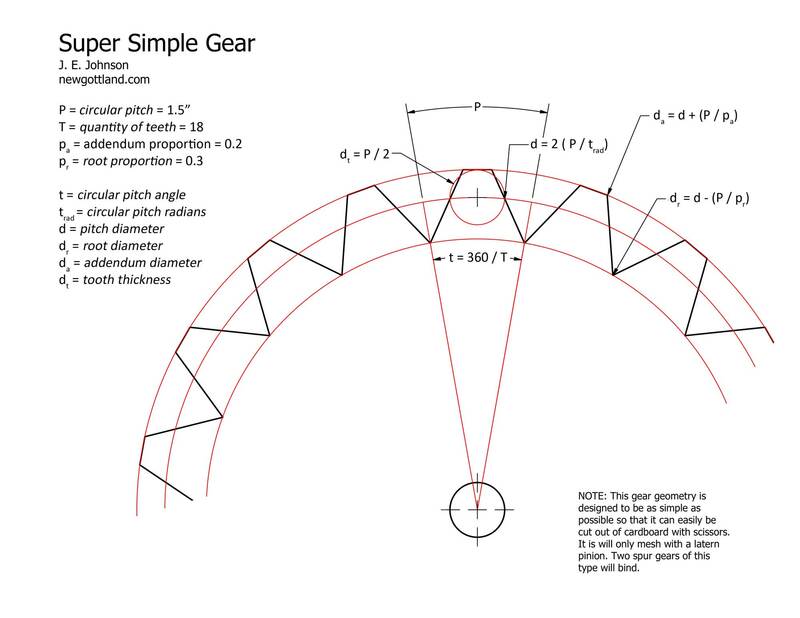 My first challenge is to design a gear train (“going train” in horology parlance) with the simplest possible tooth profile that is easy to cut out and error tolerant. Did I mention that my class budget is $125?